As a native resident of Sacramento, I recall making missions, learning about the California State Capitol, and the gold rush in fourth grade, but it’s a little fuzzy about most of Sacramento history for me. When I recently read Sacramento raised it’s city in the 1800s, much like Chicago, I was intrigued. When I was invited on a tour of Underground Tours of Sacramento, I was delighted. 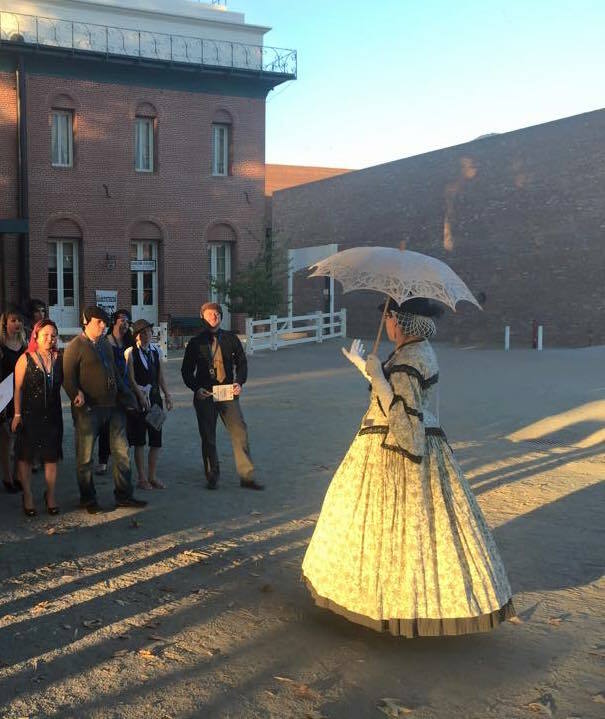 The tour starts at the Sacramento History Museum and travels through two Old Sacramento buildings, finishing at The River City Saloon. It is a 90 minute, narrated tour. Our guide was Ms. Odessa, a character from Virginia who moved out west for the gold rush. While the tour was very informative and interesting, I thought the most entertaining part was how well she played her sassy, Southern, self righteous, charming character. We toured the basement level of two buildings in Old Sacramento and learned about what life would have been like on the ground floor of these buildings between 1853 and 1861. After the great flood of 1862, some business owners chose to raise their buildings as protection from future floods. The tour discusses this process and the “new” basements of some of these buildings. When we finished the tour at the saloon, we received a shot glass and discount coupons for drinks at the saloon. Tours run on the weekends and are $15 for adults. Private party reservations are available for parties of 20, priced at $300.